Airlines are saying to families with small children: go away! I read a rumor that United, American Airlines and USAirways are no longer offering priority boarding for families with small children who need extra assistance. I had to verify the information myself to know for sure which airlines not to fly. Here's the email I sent to United. Message: I heard that United no longer offers priority boarding for families with small children. Can you verify this information, which I don't see on your website? If the airline no longer offers this service, can you let me know why? Here's what United wrote back to me. Note that United writes, "I'm sorry you are disappointed with our new boarding process." I didn't say I was disappointed in my email, but others must be emailing them saying they are. They also don't explain why they made the decision, but something else I read suggesting that some airlines want you to purchase priority boarding might be the reason why. Who knows if that's true, but I wouldn't be surprised. Thank you for contacting United Airlines. I understand your concerns and regret you are disappointed with our new boarding process. With the exception of Global Services customers, all customers will be invited to board by the Boarding Group on their boarding pass. We will still invite customers with disabilities, as well as Global Services and uniformed military personnel to board first. 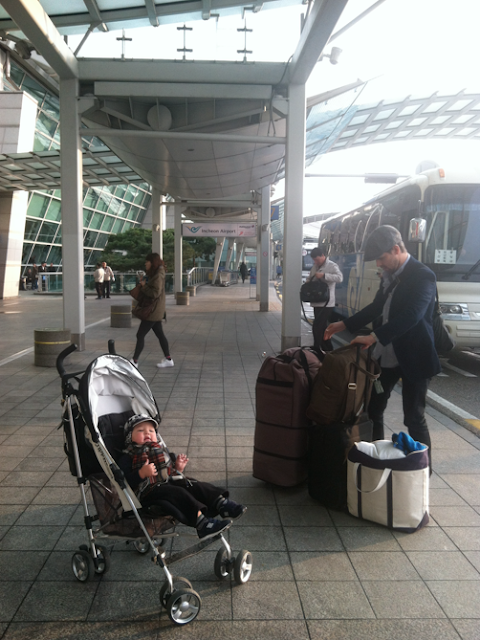 We no longer call out families traveling with infants and children under the age of four. They will board with their appropriate boarding group. If you are traveling with a companion and one of you has a higher boarding status, you both may board with the earlier group. Your feedback is more crucial than ever and will be shared with senior management for internal review. We appreciate your business and look forward to welcoming you on board a future United Airlines flight. I also reached out to American. Instead of answering my question or even pasting just a link to the page on their site (that doesn't answer my question), they sent instructions on how to get four pages deep into their site, so I can waste my time not finding the answer to my question. Here's the link that they could have told me to check out, but they could have just told me to have fun wasting my time while I go read five pages of text on their site to not get the answer to my question. I followed up with American to say they didn't answer my question a week ago and no one has gotten back to me. We are thrilled that you are interested in traveling with us. To find out all you need to know about traveling with children, please visit AA.com. On the Home Page select Travel Information, from the sub-menu click on Special Assistance and finally, Traveling with Children. Again, thanks for considering American Airlines for your trip. We'll look forward to welcoming you aboard soon. I haven't heard back from US Airways yet, but I'll update here if/when I do. The parents who don't want to board planes earlier with their little ones won't be bothered by this change in policy. But, I find that boarding later is even more stressful because all the overhead cabin space is gone and there are more people to run into with my stuff. I heard that Delta and JetBlue, which are the airlines I most routinely fly domestically, still allow families to board earlier. I'm going to stick with them. I fly American and have had elite status with them for many years. They haven't had family boarding in at least 5 years. That being said, you can usually find a friendly gate agent on American who will let families go early. Hi Anne! Oh, ok! I guess it's not breaking news. When I saw all that back and forth about this topic on PSP, I was like, I'm never flying these airlines again! After I wrote this post, I did a google search and found a lot of discussion on which airlines do and don't allow families to board early.